Here’s how the numbers see the free agent class, split into four categories: the big fish, the complimentary pieces, the bargains, and the buyer bewares. We’re about 24 hours away from July 1st and the Free Agent Frenzy is about to begin. Unlike last year’s extremely weak class, this year has some huge names attached to it which could mean the deals might get really crazy this time around. Writer-Editor Matt Larkin took you through the top 30 available players, and now we’re going to dive a bit deeper into the numbers behind some of those names. 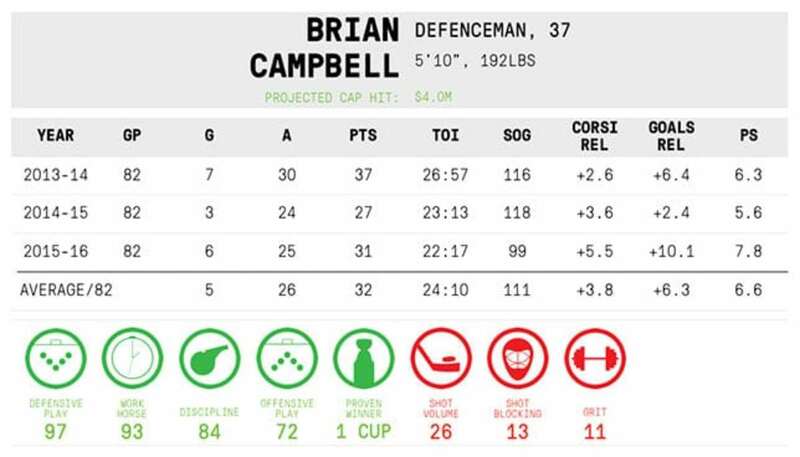 We’ll look at some key stats from the past three seasons, strengths and weaknesses and a projected cap hit using work done by Hockey Graphs analyst Matt Cane. 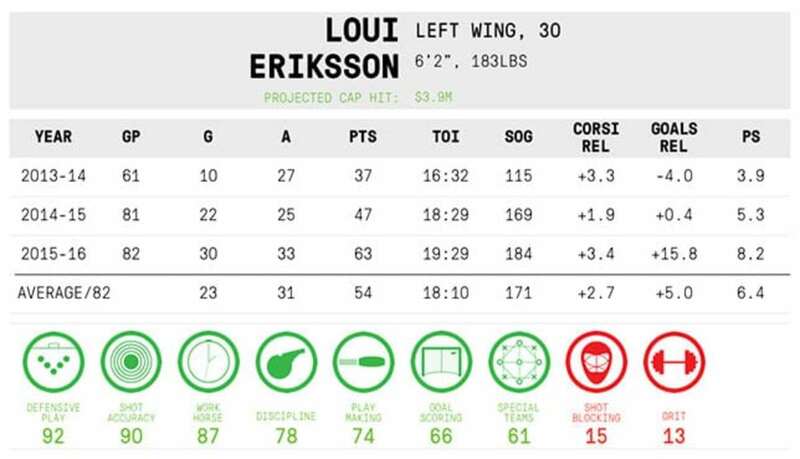 The strengths and weaknesses are based on a player’s percentile rank over the last three seasons in various stats. It’s basically a way to show what percentage of the league a player is better than at that particular skill based on the best stat associated with it. Keep in mind that not all skills are equally important. The cap projections have been pretty accurate in the past and are a great barometer for what to expect with each free agent’s contract. They’ll be useful to see if a team overpays or underpays for a player based on what previous marketplaces have valued. It should be noted that Cane’s model has some trouble predicting salaries for elite level guys, so keep that in mind with one player in particular. You can find the full list of salary projections here. THE BIG FISH: The prizes of this year’s free agent pool. There’ll be plenty of suitors lined up to give these guys plenty of dollars. Big, strong, and very good. So much so that there’s still GMs at every draft looking for the next Lucic. 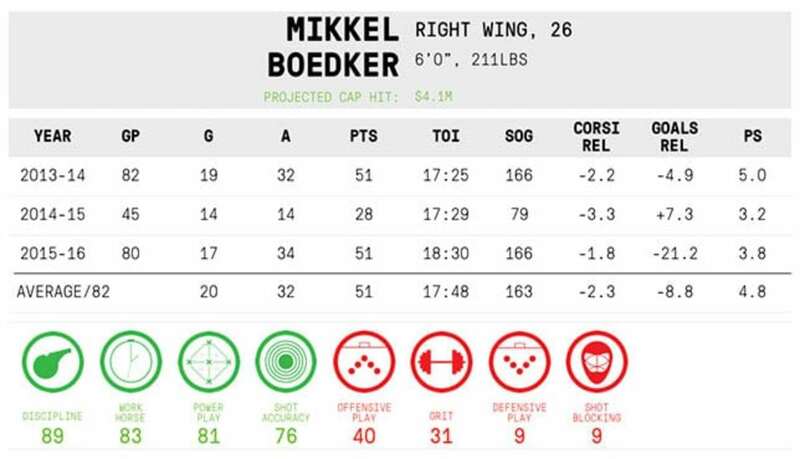 Stats folk will downplay him a bit thanks to the old-school buzzwords that constantly surround him, but he’s a legit first line winger that can score and control play. 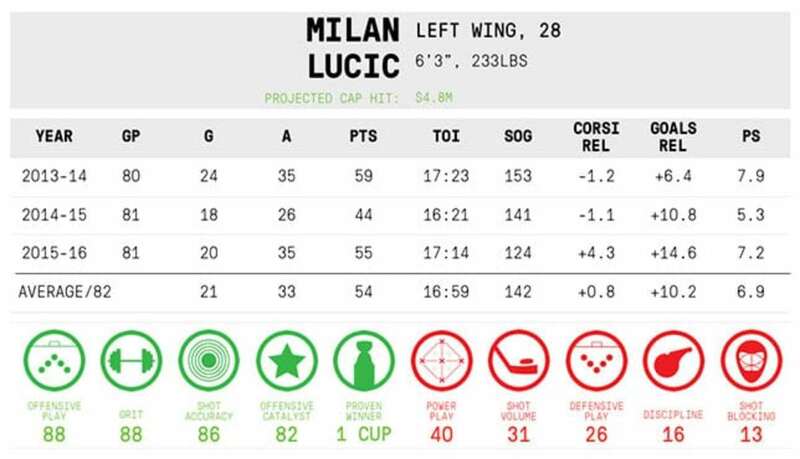 There’s a few concerns with Lucic though. He has a penchant for taking unnecessary penalties and his personal shot rates have declined which could signal the end of his goal-scoring ability. But perhaps most importantly is the mileage he’s built up by being a big, bruising wrecking ball. All those hits take a toll and any GM ready to dish out big term should think long and hard about what Lucic they’re getting in the last years of the deal, not just the first few. With Steven Stamkos off the board, Okposo is probably the next best offensive threat. He peppers the net with a high volume of shots while still dishing the puck at an elite level. An average games played rate of 70 over the last three seasons may seem concerning, but that’s likely squashed by playing 79 last year. 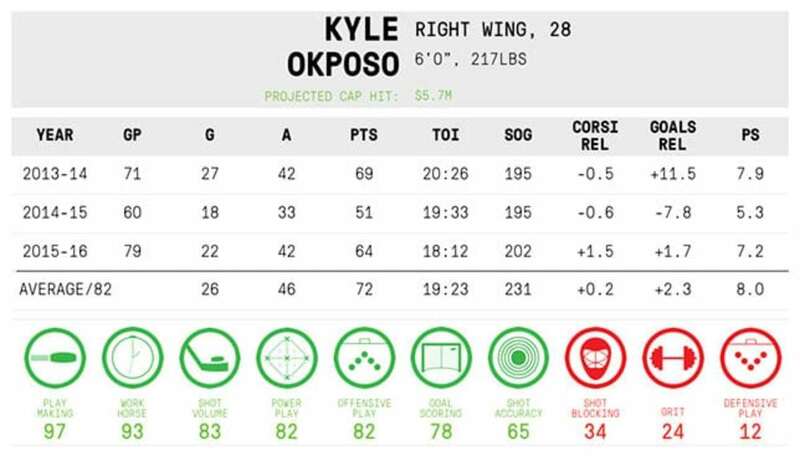 Okposo is a decent possession guy who can probably hit 60-70 points with his next team. Extremely versatile and does a lot of things very well. He can play both special teams, he forechecks well, he can pass and shoot, and he does the little things like win faceoffs, block shots and deliver crushing hits. Like Lucic though, the concern is the penalties he takes and how much longer his body can take this much punishment. At 32, he’s four years older than Lucic meaning the Backes you’re getting won’t be the Backes you’ve seen – he’s on the wrong end of the age curve. 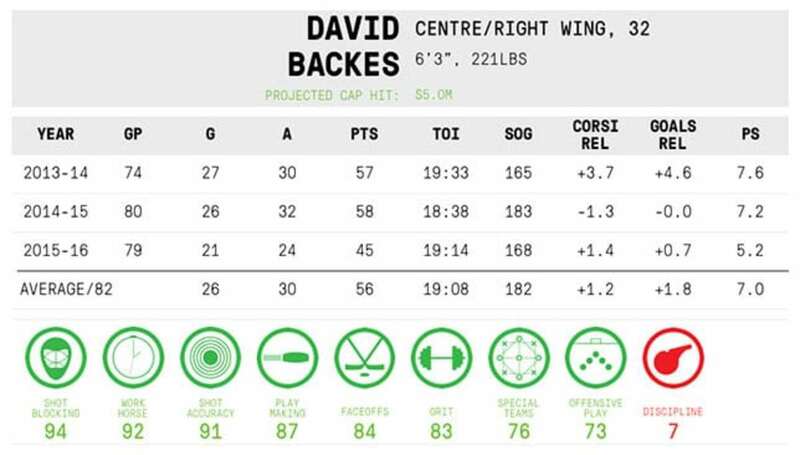 For a team ready to win, Backes could be a great piece for next season and maybe after that, too. Any longer on term (depending on the cost) and the odds of future regret get much higher. A truly great addition to any team in need of a top-six winger. He’s very versatile, plays both special teams and is a huge asset on defence – a rarity for a winger. Last year he got his scoring touch back from his previous seasons, thanks in part to finally getting a bigger role with the Bruins. At age 30, it’s probably unlikely he continues as a 60-point guy, but at 50+, that still puts him in first line territory, and he’s a terrific possession player. THE COMPLIMENTARY PIECES: They’re not top guys, but they should fit well as a key piece toward building a championship calibre roster. Arguably the best D-man available. He excels at both ends, can play big minutes, chip in a few points and his team is genuinely better with him on the ice versus off. And he does it effectively without taking many penalties. He may not block as many shots or throw as many hits as most, but he can make a great first pass and break it out quickly which means his team spends more time attacking then defending. That’s what matters most for a D-man in the current NHL landscape. A nice alternative to Backes. They’re the same age, but Nielsen has less wear and tear on his body and should age a bit better. 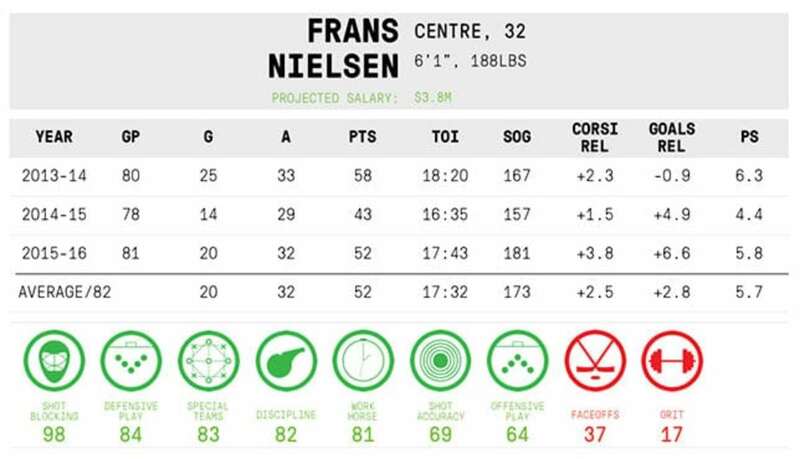 Nielsen is a great defensive centre who excels on both special teams and both ends of the ice. A very useful and versatile player that can score and control play. Not the player he once was and not worth the contract he once had, but he’s still very effective. With Staal on the ice, Carolina’s Corsi percentage was 4.7 per cent better while their goals percentage was 3.5 per cent better over the last three seasons. He doesn’t score like he used to, thanks to a low shooting percentage, but when he’s on the ice his teams play better. He could be a great fit as a second line centre. 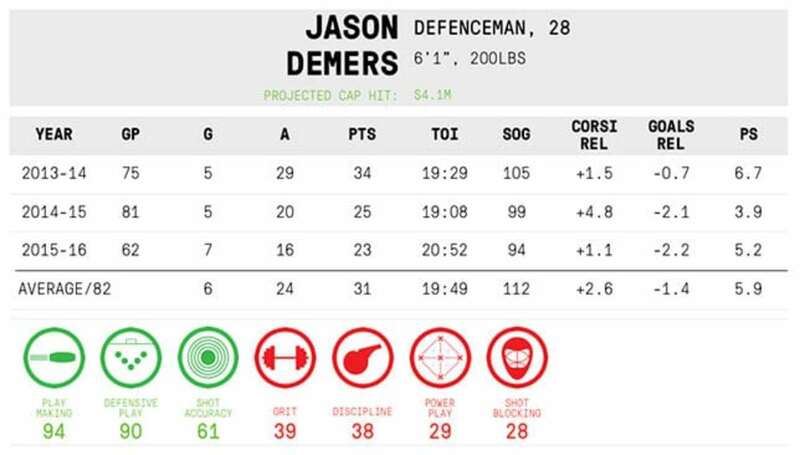 This is a tricky one as Demers could help a lot of teams as a solid second pairing guy, but the cost might rise as one of the few good D-men available. He’s one of the league’s best at suppressing shots and can make plays with the puck. Like Campbell, it’s not about hits or blocks, but about getting it out cleanly and quickly. A very capable player (for the right price). THE BARGAIN BIN: Cost-effective and very efficient. Should be solid depth additions that can help in the middle of a lineup on the cheap. Sparingly used by the Kings after the deadline despite being a very effective player on Carolina. Versteeg can chip in on offence and isn’t a drag on possession either. 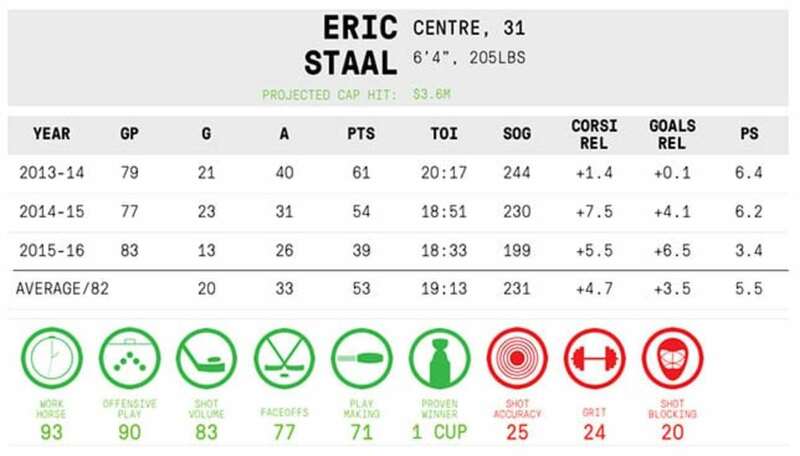 He formed a pretty potent duo with fellow free agent Eric Staal last season leading to some gaudy shot rate numbers. 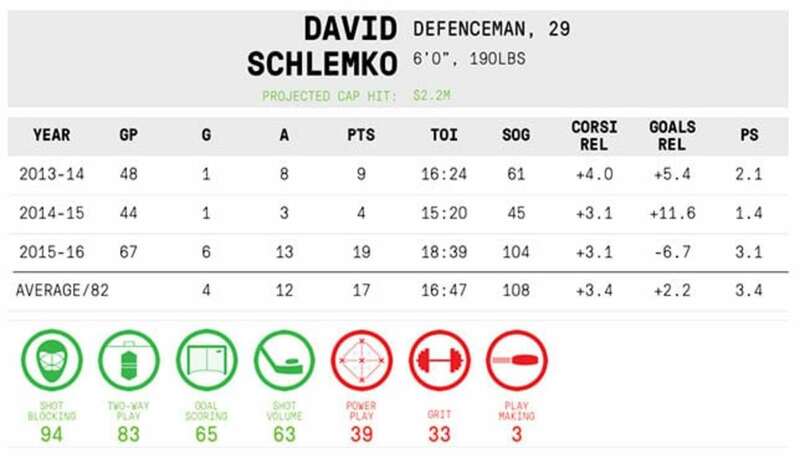 Seemingly unwanted by his last three teams, Schlemko can be a great depth add as a 5-6 guy. 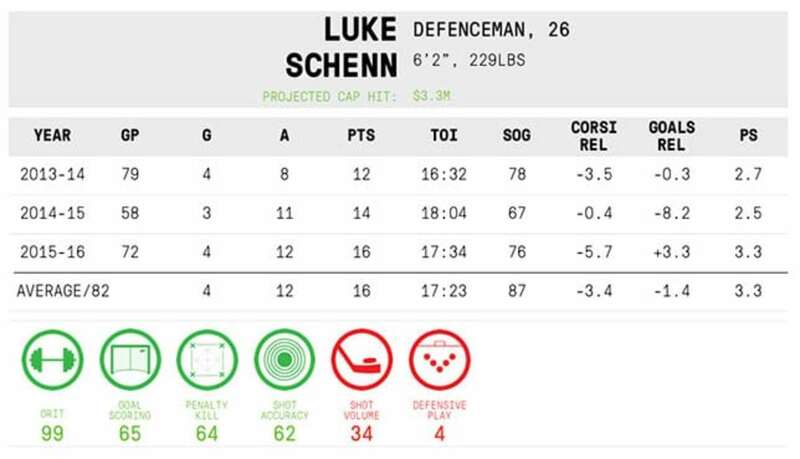 Teams need serviceable players that can do well in soft minutes and Schlemko is very much capable of that. 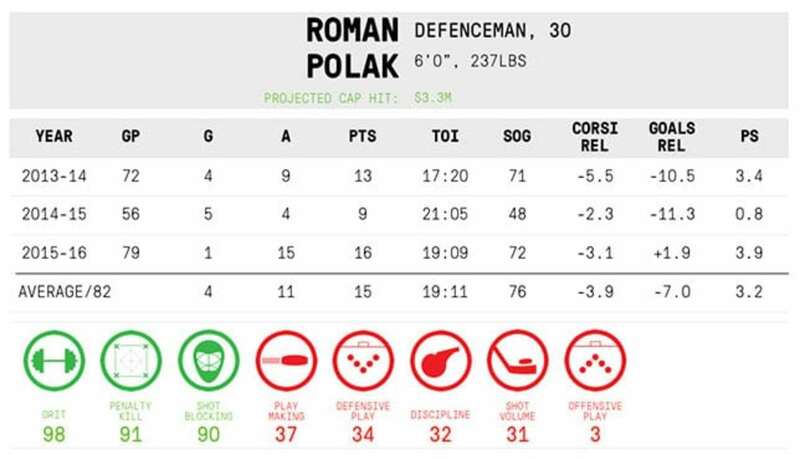 At around $2 million he’d be a solid get for a team shoring up defensive depth. Parenteau was one of the few bright spots on a depleted Maple Leafs team last year. He’s played on three teams over the past three seasons and all three scored more with him on the ice versus off. He’s a responsible two-way player that could mesh well with most teams. Perpetually underrated. There’s a few things Pirri doesn’t do well, but scoring goals isn’t one of them. 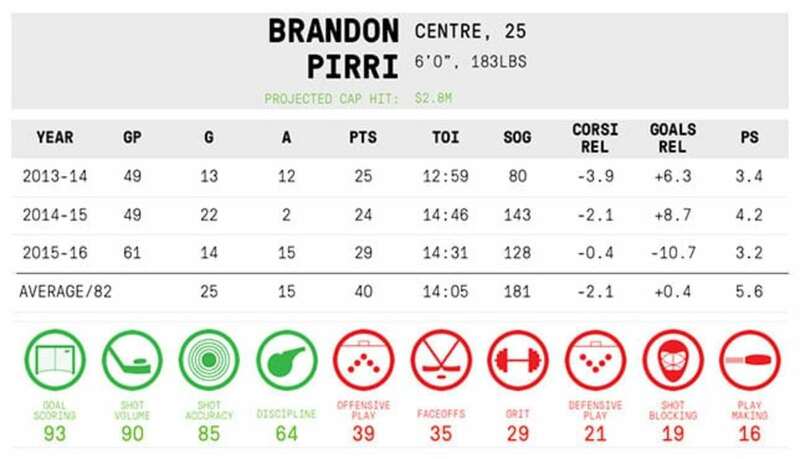 On a per minute basis, Pirri scores at a higher rate than 93 per cent of the league over the last three seasons. He’s not much of a playmaker, and he doesn’t drive play either, but he can thrive in a sheltered role providing some depth scoring. BUYER BEWARE: These guys are coveted by a few teams, but there’s a few red flags that point to a future bad contract. Russell’s next contract is the intersection between Eye Test Boulevard and Fancy Stats Lane. On one hand, there’s a guy who blocks more shots than anyone in the league and plays big minutes. On the other hand, there’s a guy who surrenders more shot attempts against than almost every other D-man in hockey. It’s a matter of what’s truly more valuable and while blocked shots are nice, always blocking them points to a bigger issue: always being in the defensive zone. Russell’s teams have been consistently outshot when he’s on the ice and signing him – especially to a big money, long term deal – could be a recipe for disaster. For three seasons, Boedker has been a 51 point player. On the surface that seems like a nice piece to add, but the raw totals are deceptive. As one of the few offensive threats on Arizona, Boedker received huge minutes, especially on the powerplay, that propped up his raw totals. On a per-minute basis, his 5-on-5 scoring rate is closer to third liner than first. On top of that are poor shot rate numbers especially in the defensive zone. All that leads to an inflated contract that he’ll likely have a hard time living up to, especially when he’s no longer getting the big minutes he got in Arizona. The two former Leafs D-men are pretty similar players: big, bruising defensemen who throw a lot of big hits, block some shots and get a lot of penalty kill duty. They’re also horrific at clearing their own zone which means they spend a lot of time there, bleeding shot attempts and scoring chances. The ‘defensive D-man’ is becoming extinct as it’s become clear the only reason they’re called defensive is because they’re always playing in that zone. Not worth the roster spot, let alone the $3 million-plus they’ll probably fetch. 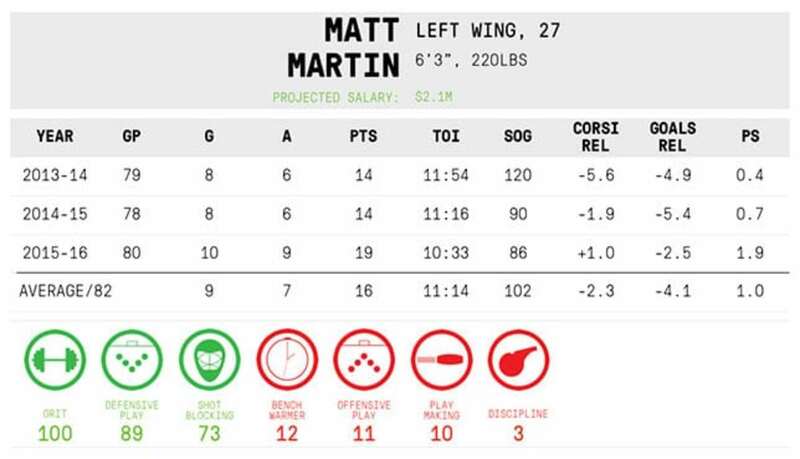 Martin was one-third of The Best Fourth Line In Hockey last season, and he’s rumoured to be up for a big payday. To his credit, he’s very good on defense which is important for a fourth line looking to not concede any goals, but it seems like there’s a premium being put on his grittiness, his leadership and the fact that he’s “a team guy.” There’s no logical reason to pay top dollar for a fourth line player providing fourth line value. He’s simply not the type of player teams should splurge on in free agency and a contract they’ll surely regret.